In May 2009, the Council of Europe organised a conference of ministers responsible for media and new communication services in Reykjavik, for which a background document on internet governance (pdf) was prepared and which led to a declaration by the ministers (pdf). In April 2011, an Internet Freedom Conference – From Principles to Global Treaty Law? took place in Strasbourg to discuss internet governance principles and to “explore viable options for creating an architecture for multi-stakeholder participation in international Internet-related public policy-making” (Source). A draft document on internet governance principles (pdf) and a draft document on the protection and promotion of the internet’s universality, integrity and openness (pdf) were prepared for debate at the conference. 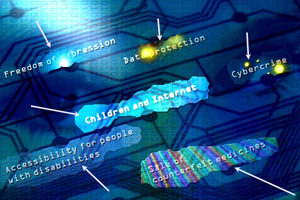 An information document entitled Internet Governance — Developing the Future Together (pdf) is regularly updated, last in May 2011. The Council of Europe’s work on internet governance is coordinated by Lee Hibbard and his team on information society and internet governance.